You'll never be quite the same. There are many more than five islands in Maine that you can visit by ferry, and I'm going to share my favorites in the next few posts. Perhaps these will help you with your summer vacation plans. 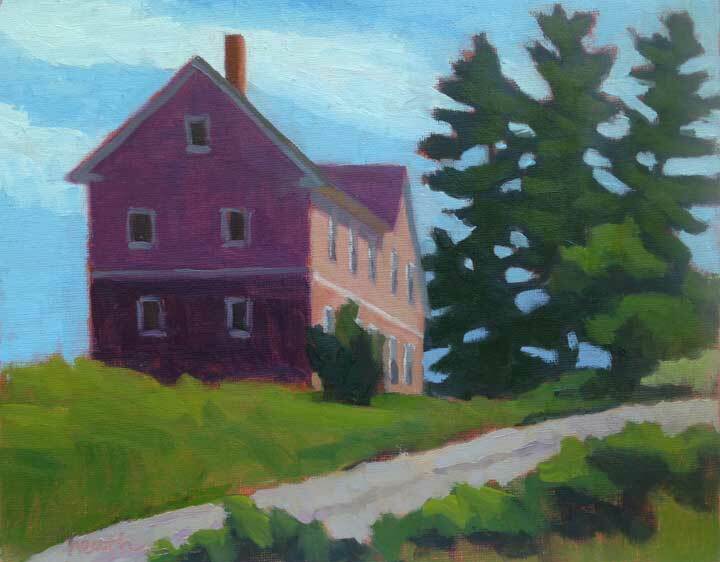 At the top of my list is Monhegan, the artist's island, ten miles off the midcoast Maine shore. 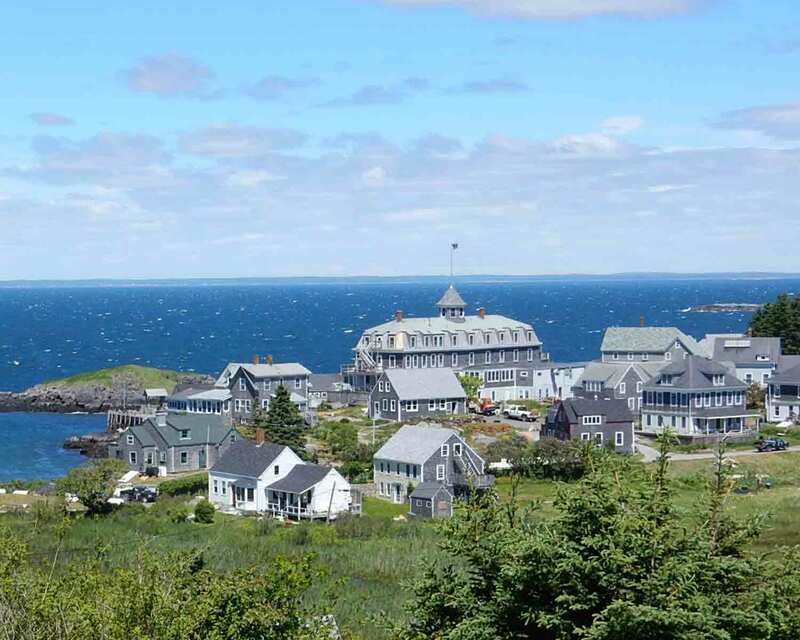 "Monhegan" comes from the Algonquian Monchiggon, meaning "out-to-sea island." It was first visited by Europeans in the early 17th century and became a British fishing camp and trading post. The island was caught in the conflict between Britain and France for control of the region, but even during the times when the island was not inhabited, the protected harbor was a stopover for ships. The current lighthouse was built in 1850, after its 25 year old predecessor was damaged by storms. There is a wonderful museum in the Lighthouse Keeper's cottage. By 1890 the island was established as an artist's colony, which continues to today. Edward Hopper, Rockwell Kent, and Jamie Wyeth are names you've probably heard. What inspires artists to paint here? The light and the subject matter. Many places that are surrounded by water are wonderful for painters because the light bouncing off the water is everywhere, sparkling and giving life to the shadows. As to subject matter, the island is made up of the village, the harbor, forests, meadows, and the dramatic cliffs on the ocean side facing the Atlantic. There's plenty there to paint. Monhegan is .7 mile wide and 1.7 miles long, and is not developed like the rest of the Maine coast. 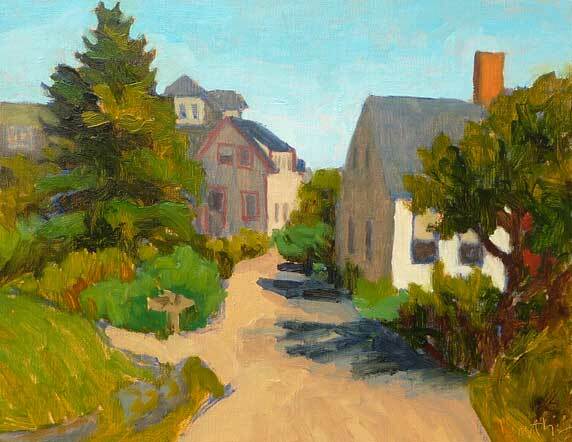 There are less than 80 year round residents, a working lobster fishing village, and a thriving artist's community. The island has no paved roads and visitors cannot bring cars, but if you are willing to walk, you are in for a treat. Two thirds of the island is protected as a nature preserve by the Monhegan Associates, "an island trust which has accepted the responsibility of holding and maintaining the land in its natural form, for all future generations to enjoy". Seventeen miles of natural trails encircle and crisscross the island, through meadows and forests, onto the headlands, and along the coves and ledges. Birdwatchers, nature lovers, and photographers will all find something to interest them. You'll likely see painters in both the village and on the ocean side cliffs. You can download a trail map of the island, courtesy of the Monhegan Associates, here. How can you get there? Monhegan is served by ferries from three Maine harbors, from southwest to northeast, BoothBay Harbor (Balmy Days Cruises), Round Pond (Hardy Boat Cruises), and Port Clyde (Monhegan Boat Line). You can visit for the day or longer. 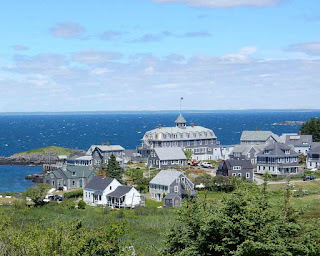 My recommendation for a day trip is to take a walk through the village and then visit the lighthouse, where you'll get a fabulous view of the village at your feet and the island of Manana, which makes up the other side of Monhegan's harbor. If you have time, continue past the lighthouse and walk through Cathedral Woods to White Head on the backside. To get a beautiful view of White Head, turn right on the trail and walk to Gull Cove. Alternatively, the walk to Lobster Cove is beautiful, and your rewards is the rocky cove and the remains of the wreck of the D T Sheridan. And FYI, these walks are somewhat rugged. Where can you stay? The largest hotels/BnBs are the Island Inn, the Monhegan House, and the Trailing Yew, each offering an experience unique from the others. And there are 11 rooms/homes listed on airbnb.com and vrbo.com at the moment. 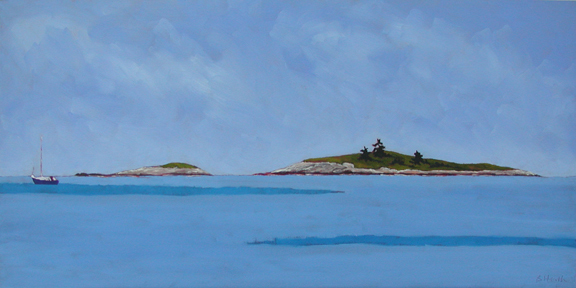 And if you do visit Monhegan, please let me know how you found it. When I first started painting, I used very bright colors, mostly green, blue, purple, yellow, and white. I didn’t understand that there are 3 dimensions to any patch of paint you put on a canvas: hue (the named color on the color wheel), value (how light or dark it is), and chroma (intensity or saturation). Think about the last one as bright (highly saturated) versus dull (grayed down). Grays are very important to balance areas that are bright, but mixing grays can be confusing, since they can become muddy. As I watch individual painters evolve over time, I often see the same progression I went through; from bright, out of the tube colors, through a phase where the artist is trying their best to paint what they see in nature, to a place where they create their own color palette. And here I’m not talking about what you squeeze out onto your physical palette, but what you mix with those colors and place on your paintings. Regardless of what color you’re trying to create, if you don’t know how to mix efficiently, you’ll end up with lots of paint you can’t use. Start by mixing only two colors together. A primary and white is the simplest example. Let’s use white and ultramarine blue. Squeeze out some of both, with some space in between. Is the blue you want closer to the tube ultramarine blue or to white in value? If it’s closer to the ultramarine blue, then pull a little of the white into your ultramarine blue pile and mix them together with the back of your palette knife. It will probably still be too dark, so pull in some more white and repeat mixing. Continue to do this until you have the color and value that you want. If what you wanted was closer to the white in value, then do the opposite, pull a little ultramarine blue into the white pile, mix, and repeat as above. Contrast the above with plopping down two pretty much equal blobs of ultramarine blue and white and simply mixing them together. To get what you want, you’re going to have to add more and more of one or the other, and you’ll have LOTS of paint by the time you’re done. The above is illustrated in this video. The more pigments you mix together, the more likely you are to get mud. A limited palette helps prevent this. You’ll also spend less money on paint and have less paint to carry around if you use a limited palette. What is this limited palette? Ideally it would be just the primary colors and white. The secondaries can be made from the primaries, but not vice a versa (try it if you’re not sure). The primary colors tend to have only one pigment in the tube. The problem is that none of them are exactly the color we see on the color wheel. Ultramarine blue is a little on the purple side of blue, and cobalt and phthalo blue are a little on the green side. But we can take advantage of that. If we mix a red and a blue that lean to the purple side together we get a really bright purple. 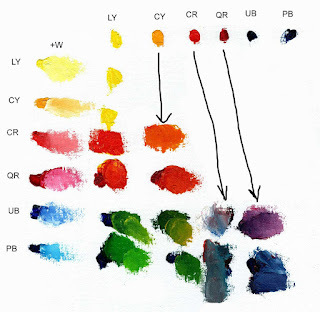 And if we mix the red that leans toward yellow and the blue that leans toward green, we get a grayed down version (see the color mixing chart above). So if we have two of each primary and some white we can make everything we need, with a minimal chance of mud, and control over our grays. My paintings improved so much once I mastered this! White isn’t always the best way to make a color lighter, yellow can be a better choice, especially with reds. And it’s best to first block in the darks and then the lights (those mixtures that contain white), because it’s very hard to paint dark into light paint while both are wet. To practice paint mixing, get some pleasing color chips from the hardware paint department, and try mixing them. When you’re close, put a little of the mixture on the paint chip. Is the color right? Squint to make sure the value is right. Thanks to Leslie Saeta for this idea.